Qiblah (Qibla or Kiblah) is the direction of the Sacred Mosque of Holy Kaabah (Kaaba) in Makkah, Saudi Arabia, toward which Muslims from all over the world turn five times each day when performing the Salat (daily ritual prayer). 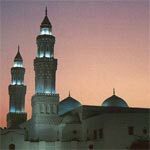 Baitul-Maqdis in Jerusalem was the first Qiblah for Muslims before the announcement of present Qiblah at Sacred Mosque of Holy Kaabah (Kaaba) in Makkah, Saudi Arabia. When Allah (SWT) first ordered Prophet Mohammed (saw) and all Muslims to offer the daily Salat (Salah), they prayed facing Baitul-Maqdis in Jerusalem, Palestine. This was the practice in Makkah and continued in Medina until the seventeenth month after Hijrah (migration). At the heart of Jerusalem is the Noble Sanctuary or Al-Haram al-Sharif, enclosing over 35 acres of fountains, gardens, buildings and domes. At its southernmost end is Al-Aqsa Mosque and at its center the celebrated Dome of the Rock. The entire area is regarded as Baitul-Maqdis or Al-Qudus and comprises nearly one sixth of the walled city of Jerusalem. 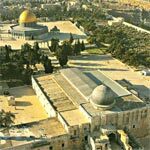 It is clear that Masjid al-Aqsa and Dome of the Rock (Qubbat as-Sakhra) are two separate buildings, and not synonymous with each other as believed by some Muslims. 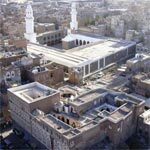 However, both these buildings are within the enclosure of Al-Haram al-Sharif referred to in Glorious Qur'an as "the Furthest Mosque" in Surah al-Israa (Chapter 17:1). In Medina, the Jews also said their prayers facing Baitul-Maqdis. They did not like the fact that the Muslims had the same Qiblah as they did, and tried to use this fact to discredit Islam and Prophet Mohammed (saw). They said to the Muslims, "Mohammed claims to have a religion whose laws supersede all other previous laws, yet he does not have an independent Qiblah, and offers his prayers facing the Qiblah of the Jews." One day, while Prophet Mohammed (saw) and the Muslims were praying together, the command came from Allah to change the Qiblah from Baitul-Maqdis to Sacred Mosque of Holy Kaabah (Kaaba) in Makkah. After Prophet Mohammed (saw) had already completed two Rakaats of the noon prayer in congregation, the Angel Jibraeel (Gabriel) communicated to him the mandatory divine command of Allah (SWT). Jibraeel (as) held the hand of Prophet Mohammed (saw) and turned him towards Holy Kaabah (Kaaba) in Masjid al-Haram in Makkah. Prophet Mohammed (saw) at once changed his direction in the middle of Salat. Imam Ali (as) followed this change immediately. The other Muslims were confused by this action and only a few followed the example of Imam Ali (as). The mosque where this happened is known as "Masjid-e-Dhul Qiblatain or Masjid Al-Qiblatain" which means "Mosque with two Qiblah". This is one of the famous and oldest mosques in Islamic history, still exists in Medina today few kilometers from Masjid al-Nabawi. It had two Mihrabs, one Mihrab is facing "Baitul-Maqdis" and the other one is facing "Masjid al-Haram". It was one of the Prophet Mohammed's (saw) miracles that he turned exactly to face the Holy Kaabah (Kaaba) without the use of any scientific instrument or computation. The change of Qiblah from Baitul-Maqdis to Sacred Mosque of Holy Kaabah (Kaaba) was a puzzle for everyone; those, who were of the opinion that every rule ought to be permanent and unchanging, mused: If we had to necessarily pray in the direction of the Holy Kaabah (Kaaba), why was it not ordered from the very onset? And if Baitul-Maqdis, which had been regarded as the Qiblah for the previous Prophets, was superior, why then was it changed? The enemies too found the issue a fertile ground to poison the minds of the people. They probably might have said: At the start Prophet Mohammed (saw) turned towards the Qiblah of the previous Prophets but after tasting victories he was overcome by racial and nationalistic tendencies and therefore substituted it with the Qiblah of his own people! Or they might have said: Prophet Mohammed (saw) initially accepted Baitul-Maqdis to be his Qiblah in order to attract the Jews and the Christians towards his religion, but later, when he observed that it did not prove effective, he changed it to Holy Kaabah (Kaaba). And it is for this reason that the Glorious Qur'an explicitly states in verse 143 of the chapter al-Baqarah as mentioned above that this was a great trial to discern the stance adopted by the believers and the polytheists. In that period, since Holy Kaabah (Kaaba) had been the hub for the idols of the polytheists it was ordered that the Muslims should temporarily offer their prayers in the direction of Baitul-Maqdis and in this way separate their ranks and disassociate themselves from the polytheists. But when they immigrated to Medina and established their own community and rule, and when their ranks were completely demarcated from that of the others, it was not necessary to continue with the existing posture and hence they returned towards Holy Kaabah (Kaaba), the most ancient focal point of the Prophets and the center of monotheism, which had been constructed by Prophet Ibrahim (Abraham), was respected by the entire Arab society. 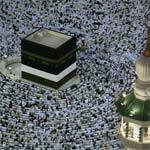 To declare such a place the "Qiblah" ensured satisfaction of the Arabs in general and attracted them towards Islam. It is plainly evident that offering prayers in the direction of Baitul-Maqdis was very difficult for those, who regarded Holy Kaabah (Kaaba) to be the spiritual edifice of their own tribe, and equally difficult was the return towards Holy Kaabah (Kaaba), after having become habituated to the first Qiblah. 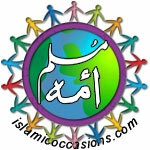 In this manner the believers were placed in a crucible of examination in order that the traces of polytheism, which still existed within themselves, get burnt away in the hot furnace of this test, they sever their association with their polytheistic past, and there develops within them the spirit of absolute submission before the orders of Allah (SWT). Also, there was no hope that the Jews of those days would embrace Islam and therefore, appeared necessary that the Muslims should remain at a distance from them, because they indulged in obstructionist activities and wasted the time of the Prophet Mohammed (saw) by putting forward knotty questions, whereby, according to their own thinking, they displayed their knowledge and wisdom. Change of Qiblah was one of the manifestations of seeking distance from the Jews, just as fasting on the day of "Ashura" (10th day of Muharram) was abolished for that very purpose. Before the advent of Islam the Jews used to fast on the day of "Ashura" and the Prophet Mohammed (saw) and the Muslims had also been ordered to fast on that day. Later, however, orders regarding fasting on the day of "Ashura" were withdrawn and instead fasting during the month of Ramadan was made obligatory. After all, religion of Islam, which is superior to other religions in all respects, should manifest itself in such a way that the points of its perfection and superiority should become absolutely clear. Note: It should be noted that Muslims do not worship the Holy Kaabah (Kaaba) or its contents; the Holy Kaabah (Kaaba) is simply a focal point for prayer. Basically, Allah (SWT) does not possess any place or location; the Qiblah is just a code for establishing unity within the ranks of the believers and reviving the reminiscences of monotheism and so, changing it would not transform anything. The important thing is to submit to His commands and shatter the idols of fanaticism, stubbornness and egotism. Under the religion of monotheism, do people unite. While disunited, glory you cannot gain. Your Prophet just came to save you from that plight. To make you one nation, so you do remain. Without that unity, your efforts are in vain. The Qiblah is important because it gives us a sense of unity, uniformity and discipline. If there were no Qiblah, we would pray as isolated groups without being connected to one another. The Qiblah gives us a focus; a common sense of purpose; a direction. In consideration of the above verse the question that comes to mind is: If Allah (SWT) is present wherever we face, what then is the need to face the Qiblah (during the prayers)? (The order for) facing the Qiblah is not at all intended to confine the presence of Allah (SWT) in a particular direction. However, since man is a material entity and thus, must necessarily face a direction while offering his prayers, it has been ruled that all should face one particular direction during their prayers. This is with the objective of realizing unity and harmony amongst the Muslims, and preventing confusion, disorder and scattering amongst them. Just reflect how scathing and disorderly it would be if each person were to offer his prayers in a different direction and the people were to establish scattered rows (for the prayers)? No human on earth can draw a straight line on the surface of the earth between two far cities except with the aid of detailed maps, made possible today due to airplanes, satellites, and knowledge of altitude, longitude, and land height. However, there was a person who had done this 1400 years ago. This person is Prophet Mohammed (saw). Until there came the help of Allah (SWT) and victory, and people were entering Allah's religion (The way of Islam) in crowds. 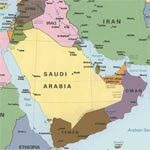 From then on, Islam was spreading and the people of Yemen become Muslims. Then, Prophet Mohammed (saw) started to send the teachers to these people to teach them Islam. He (saw) sent Imam Ali ibn Abu Talib to Hamdan, Muath ibn Jabel to Janad. One of them Wabr ibn Yuhanas Al-Khozaee (May Allah be pleased with Him) whom Prophet Mohammed (saw) sent to Sana'a, in Yemen. Wabr ibn Yuhanas al-Khozaee (May Allah be pleased with Him) was a companion who Prophet Mohammed (saw) sent as a protector over (Sana'a, in Yemen). He (saw) was ordered to teach people of Sana'a and to build them a Mosque by features Prophet Mohammed (saw) had defined to him. Al-Tabarani narrates in the Al-Mu'jam Al-Aswat saying: Wabr ibn Yuhanas Al-Khozaee (May Allah be pleased with Him) relates that Prophet Mohammed (saw) said to me, "If you build the Mosque of Sana'a, make it to the right of Jabal Deyn (Deyn Mountain)." Prophet Mohammed (saw),1400 years age, ordered to build the mosque Sana'a facing Jabal Deyn (Deyn Mountain). If we use Google Earth today and draw a straight line from the mosque Sana'a to the Qibla (direction of prayer) which is in Makkah, it will pass through the peak of Jabal Deyn (Deyn Mountain) and will end at the center of Holy Kaabah (Kaaba). How could someone 1400 years ago have shown the exact direction for Holy Kaabah (Kaaba) from a far away city without using the modern aids needed for such a process? SubhanAllah (Glory be to Allah)! Of course this is a miracle!